I wanted to begin comparing Beauty and Drug Store makeup products to determine if, price and brand name aside, they both delivered the same thing. Stila costs $26.00 CAD and Maybelline is $10.00 CAD. 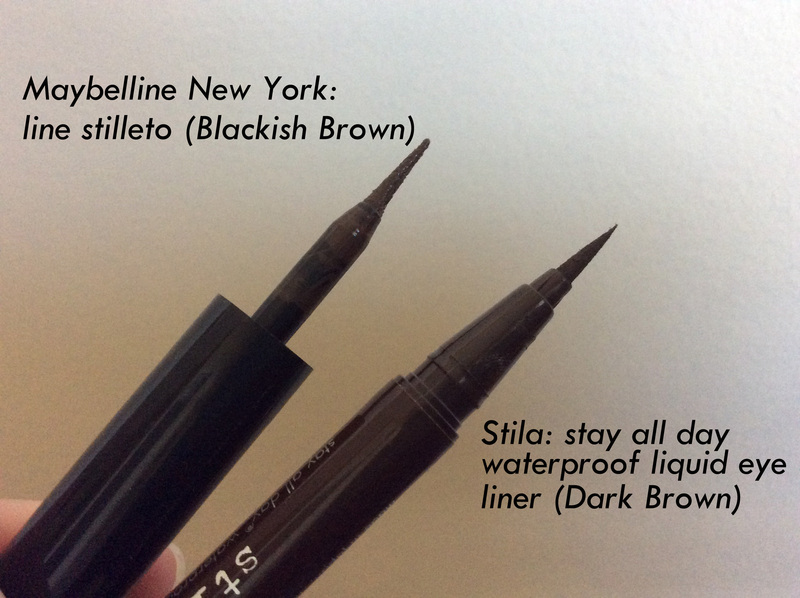 These two have the same felt tip applicator, although Maybelline’s applicator is a bit larger and rounded while Stila has a sharp tip. If you want a really precise line or a thinner wing you’ll get that easily with Stila. If you wear your eye liner a bit thicker Maybelline will do the trick. 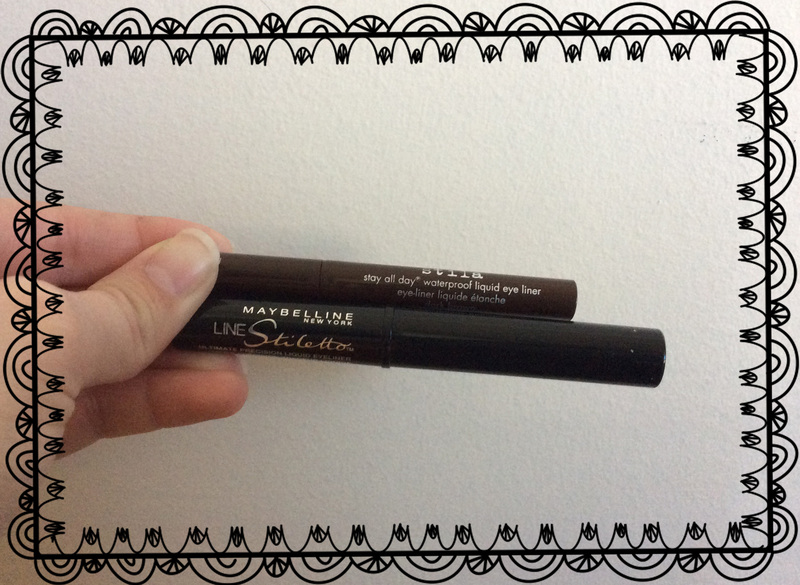 Maybelline’s tube is a bit thicker too, like holding a marker compared to the pen-like size of Stila’s applicator. Both are easy to grip which is important when keeping a steady hand. The colour is exactly the same, I almost forgot which was which after I put them on. Maybelline is a bit more watery when you first apply it and can bleed if you’re not careful. Stila gives just the right amount of colour so you don’t need to be very careful. Both have great pigmentation. Stila by far knocks this one out of the park. 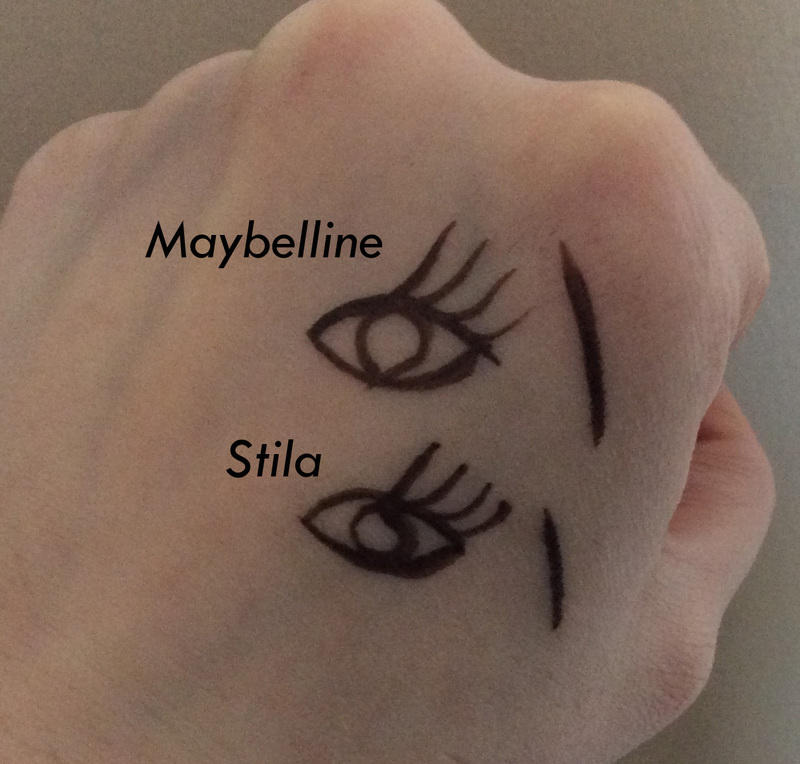 Stila took only 1 minute to dry on my hand while it took about 10 minutes for Maybelline. Once they dried, however, no amount of rubbing could remove either of them from my hand. Liquid liners come off very easily in comparison to pencil or gel liners with the use of makeup remover. I was a bit dissappointed Stila though. For a waterproof liquid liner, it came off quite easily with only a little bit of water. Maybelline made no such claim so I wasn’t suprised when it came off with water. This is the annoying part of any liquid eyeliner really, if it starts raining, or you start sweating or worse, crying, they are going to come off completely. That’s why I never wear them in my waterline. I choose Stila. When creating a look with liquid liner, it’s just nicer to have a bit more control over the thickness of the line and I like not having to wait so long for the product to dry. I am impressed with Maybelline though, the price and wear is great. If liquid liner is not something you wear all the time like I do, this works amazingly for those times when you want to add it. So what do you think? What Drug Store Liner have you tried? Is there a Beauty Store Liner you like? For those who aren’t very confident putting on liquid liner, I feel your pain. I really sucked at application before I started wearing it everyday. You need to be very patient and practice (I used to apply it over the weekends when I had nothing else to do.) A way that I started getting comfortable is I began by just applying it against my eyelashes. Putting a line right against my eyelashes was 1; easy to do and 2; made my lashes look fuller. When I got comfortable doing that, I started slowly adding a second thin line on top of that from the middle of my eye outward. Then another line on top of that, again from the middle of my eye outward. This is any easy way to get a simple winged looked by building on what I had mastered before. Agreed! I honestly didn’t think it would be so good, but it was. WOW! What a huge difference – 1 minute dry time versus 10 minutes! Awesome post!